Larry Edwards unmasks the emotional trauma of violent loss as he ferrets out new facts to get at the truth of how and why his parents were killed. Larry M. Edwards is an award-winning investigative journalist and the author of three books. He won first place in the 2014 San Diego Books Awards for Best Published Memoir for Dare I Call It Murder? : A Memoir of Violent Loss. The book was also nominated for a Pulitzer Prize (2014), a Washington State Book Award (2014), and an IBPA Benjamin Franklin Award (2014). Previously, he won Best of Show honors from the San Diego Press Club in 1994, 1997, 2004, and 2005, in addition to numerous other awards from the Society of Professional Journalists and San Diego Press Club. Edwards served as business editor, investigative reporter, and feature writer for San Diego Magazine. He also served as editor of The T Sector magazine, Maritime Quarterly, and San Diego Log, as well as a staff writer for the San Diego Business Journal and San Diego Log; he worked as a stringer for the Associated Press, covering the America's Cup sailing regatta. 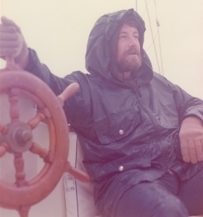 His articles have appeared in dozens of publications worldwide, including 48° North, Alaska Airlines, Grand Prix Sailor Weekly, Los Angeles Times, New Zealand Herald, Puget Sound Business Journal, Sailing, Sailing World, San Diego Metropolitan, San Diego Reader, San Diego Union, The Yacht (Germany), Yachting, and Yachting World (UK). He currently works as a freelance writer, book editor, and publishing consultant to Wigeon Publishing, and has served as a judge for the San Diego Book Awards since 2005. Outside of writing and editing, Edwards plays the fiddle in several old-time music and bluegrass bands. He lives in San Diego, California, with his birding-enthusiast wife, Janis Cadwallader. For more information about the author, please visit his website: LarryEdwards.com.